Effortless elegance at one of the UK's top wedding venues. Wilton Celebrate understated elegance at Statham Lodge. Traditional Georgian designs complement historic wedding venue. Ready to Go axminster woven and tufted wool commercial carpets are ready for fast delivery. Ready to Weave axminster carpets offer a library of designs, recoloured to meet the needs of your project. Bespoke brings a design and colourway of your choice, crafted in wool-rich woven axminster. The unhindered output of our creative team, Design Collections are crafted to inspire. All of Wilton’s carpets are made from luxurious British wool-rich yarn, proven to produce the best of carpets and delivered to you direct from the UK. With our rich heritage, manufacturing expertise and inspirational designers, all based in the UK, we create carpets that add to the interior architecture of some of the world’s most iconic buildings. We pride ourselves on creating beautifully-designed, long-lasting carpets that exceed expectations and delight our customers. If you’re looking for inspiration then check out the new Wilton Carpets Design Hub, where you can explore our huge library of designs by colour, construction, availability or pattern. 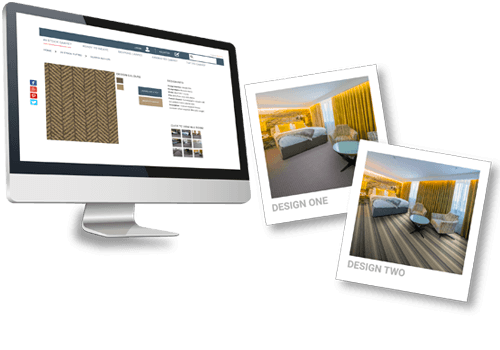 Simple to use, the Design Hub will also let you order samples and visualise your chosen designs in standardised rooms, as well as download images for presentations. You can even recolour some of our designs ‘on the fly’, making the Design Hub a great place to start exploring. Providing stock, custom and bespoke wool hotel carpet crafted in Britain, here at Wilton Carpets we specialise in woven and tufted carpet for traditional and modern hotels. Whether a large city hotel, country house hotel, boutique hotel or bed and breakfast, Wilton Carpets can provide hotel carpet that’s beautiful, enduring and easy to care for; everything a hotel carpet should be. With members demanding high-quality interiors that reflect the status of their club, the selection of quality carpet is important and Wilton Carpets can provide high-quality woven and tufted golf club carpet or country club carpet. With stock, custom and bespoke wool carpet crafted in Britain, Wilton Carpets bring golf club carpet and country club carpet that’s beautiful, enduring and easy to care for. With a pattern library including historic and heritage carpet designs, Wilton Carpets is one of the UK’s leading authorities on woven axminster wool carpet for historic and heritage buildings. From faithful reproductions of original carpet designs in high-quality woven axminster through to contemporary interpretations of period designs for historic buildings with a modern purpose, Wilton Carpets has a long record of manufacturing wool historic and heritage carpet. Selecting the right entertainment carpet for your gaming, leisure or entertainment venue requires thought about carpet design and durability. With the ability for precise pattern reproduction and suitable for use in high-wear situations, wool-rich woven axminster carpet from Wilton is ideal as entertainment carpet and leisure carpet. Town halls, council buildings, public libraries and galleries come under intense use and as focal points for communities, these often historic or prestigious buildings require high-quality woven wool public building carpet. Wilton Carpets can provide public building woven wool carpet that is durable and easy to maintain under normal maintenance regimes. Selecting the right leisure carpet for your gaming and entertainment venue requires thought about leisure carpet design and durability. With the ability for precise pattern reproduction and suitable for use in high-wear situations, wool-rich woven Axminster leisure carpets from Wilton are ideal for any entertainment venue. With expectations for attractive, quiet and comfortable learning and conferencing environments from students and attendees, Wilton Carpets can provide an Education Conference carpet that’s beautiful, enduring and easy to care for; everything a further education and conference carpet should be. From a simple idea to a complex brief, the Wilton Carpets UK-based design team will help to turn your ideas and concepts into a reality. We work closely with clients, designers and specifiers and whether influenced by furniture, architectural details or pure aesthetic, Wilton Carpets’ designers will translate your vision into stunning spaces.